It’s well know that members of the Amish faith eschew modern or ‘English’ conveniences like cars, farm tractors, municipally-supplied electricity, land-line phones – and computers. Yet, the cabinetmaking industry supports thousands of Amish people. Also, much of the fine furniture the Amish produce is sold outside Amish communities – including online. And this is why “ Amish Furniture Online: Exploring the Paradox” is a must read. 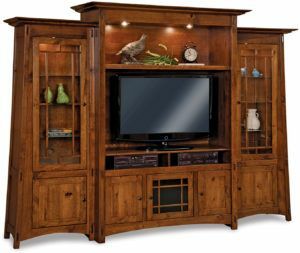 This full-featured wall unit is an example of the Amish-built, solid wood furniture available online from Brandenberry. Over the past 20 years, the explosion of the World Wide Web has revolutionized the way the world communicates. Now, people enjoy instant access to friends and family around the globe. And they do this through a number of social media platforms. The sites include Facebook, instant messaging and video chat. The internet has emerge as a major channel for shopping. In fact, online selling has revolutionized the way people shop. Online stores like Amazon have become iconic mass merchandisers. And traditional ‘brick and mortar’ chains — such as Walmart, Target and Macy’s – have developed vibrant online stores. Furniture stores have also developed a sizable internet presence. In fact, most leading traditional furniture brands sell their products online. Also, Brandenberry Amish Furniture has emerged as a leading online supplier of Amish-crafted, custom-made hardwood furniture. Brandenberry’s ‘brick and mortar’ store is located in Shipshewana, Indiana. Shipshewana is home to a large Amish community. And thousands of tourists visit Shipshewana each year. The Brandenberry store allows visitors to see and experience furniture built by several Amish furniture manufacturers – primarily in the Northern Indiana area. In fact, Brandenberry’s website features thousands of products – far more than the number of products displayed on the showroom floor. And Brandenberry ships furniture directly to customers’ homes. Amish and Mennonite people have mixed reactions to selling products to the outside world. Some see it as an intrusion of the world into their form of life. Others accept it an inevitable development – or even as a positive thing. In fact, many Amish people operate stores and roadside stands. And since the Amish do not compromise any of their faith values, many see it as win-win. Without a doubt, Brandenberry Amish Furniture’s website is perhaps the best way for furniture lovers across the United States to explore Amish furniture. And purchase the pieces that meet their needs and desires. All from the comfort of their own home – or wherever else they access the web. So log onto www.brandenberryamishfurniture.com. And explore the thousands of genuine, Amish custom-made, solid hardwood furniture. All with a few mouse clicks. Then place your order, or talk with one of our experienced product specialists. They would be delighted to help you decide on the perfect Amish furniture for your home.